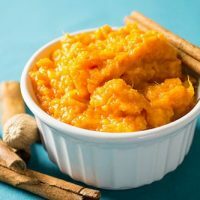 Easy recipe for mashed sweet potatoes with honey butter, plus bonus information for perfect baked sweet potatoes. 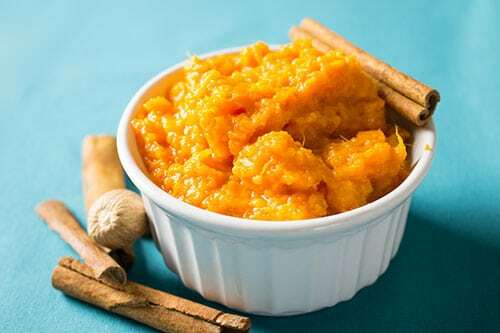 There are many things in the kitchen that are pretty easy to cook and mashed sweet potatoes are one of those things. In my opinion, cooking a sweet potato is cooking 101. If you’re a relatively inexperienced chef, keep on reading. If you’re an experienced home chef, you can probably skip to the delicious recipe closer to the bottom of the post. Everyone has seen someone massacre a sweet potato by boiling it in water. I think this is about the worst thing you could ever do to a sweet potato. Roasting it in the oven or baking it in aluminum foil is the best way to maintain, if not improve, the flavor. The key to baking a sweet potato is knowing when it’s done. Undercook it and you’ll be eating grit. Overcook it and you’ll squeeze the moisture out of it and you’ll be left with a watery stringy mess. Bleh! Ok, a critical part to cooking a sweet potato begins at the grocery store. The size really doesn’t matter. What does matter is that you buy all of the same sized sweet potatoes. You want them all to get done cooking at the same time, so don’t go buying big potatoes and little potatoes. I have seen some pretty huge sweet potatoes and some so small I’m not sure why the store is even selling them. I prefer to buy sweet potatoes that are about 2.5 inches in diameter. Buy too small and they can overcook quickly. Buy too large and the interior can be undercooked while the exterior is mush. Make sure you are buying the orange version of sweet potatoes and not some other tuber, if it is called a yam it is probably actually a sweet potato, but since there is some confusion, thekitchn.com has the perfect visual for knowing the difference. Check them out if you really don’t know the difference. So you have sweet potatoes. Set your oven to 425 degrees F.
I know this seems high, but it does hasten the cooking process. You can go lower, but the potatoes will take longer to cook. Anyways, wrap your sweet potatoes in aluminum foil and toss them in the oven. After about 45 minutes to an hour, you’ll want to check the potatoes for doneness. To do this, use an oven-mitt and give them a squeeze. If they are still very firm, they aren’t done. If they are super squishy, they are probably overcooked, but they are still edible and tasty. They just might be a little watery. Properly done potatoes should have just a little bit of give. Feeling your potatoes might take some practice. However, once they are done, just toss them on a high-temperature safe surface (like a cooking range) and let the potatoes cool for about 15 minutes. They are lava hot right out of the oven. So, you’ve successfully cooked your sweet potatoes. Now what? Sweet potatoes are a pretty versatile little vegetable (are sweet potatoes even vegetables?). There are a lot of flavor combos you can stick in them. Butter and cream. Pro Tip: Don’t be a sissy and use milk. Use real cream in all of your potato recipes if you’re going to use any dairy. You’ll need less and the flavor will be better. If you are lucky enough to live near a WholeFoods (we call this the “$300 store” because my wife and I can’t walk out without spending $300 on cheese, cured meats, and seafood) or another high-end grocery store, you might be able to find Japanese sweet potatoes. These things are the fricken bomb and blow normal sweet potatoes out of the water in the flavor department. They don’t even look like normal sweet potatoes. They Are purple on the outside and yellow/green on the inside. You can’t treat them like normal sweet potatoes. The flavors are more suited to savory flavors, such as chives or green onions. My favorite way to eat Japanese sweet potatoes is with butter, chives, and a bit of salt. That’s it. By now you are getting tired of me rambling on about sweet potatoes and you wish I’d get to the damn recipe. Printable versions of the recipes are at the bottom of the post. So here we go. For the best sweet potatoes on the planet, you need to start off with some standard ingredients you probably already have. You will need butter, honey (preferably from someone locally), cinnamon, nutmeg, salt, and pepper. Bake yourself three decent sized sweet potatoes. You’ll need roughly one to one-and-a-half pounds of sweet potatoes. Wrap them in foil and bake at 425 degrees F until cooked. In a bowl, add 8 tbsp butter, 1/4 cup of honey, 1/2 tsp cinnamon, and 1/8 tsp nutmeg (I don’t usually bother measuring this out. I just use my microplane and grate enough that looks right). At this point, you have the worlds tastiest honey butter that’s also pretty badass on dinner rolls. In a second larger mixing bowl, add the sweet potatoes. You can usually peel the skin off very easily just by pulling it off. Mash up the potatoes to break them up. You don’t need to mix the potatoes until they are pulverized. Add the honey butter mixture and mix to combine. Taste your creation and add salt and pepper to taste. These usually make an appearance at holiday meals. Try serving with our turkey dressing, holiday jello salad, and pecan pie bars. You will feel like you are our house for the holidays. Wrap sweet potatoes in aluminum foil. Bake sweet potatoes until they are soft. Add sweet potatoes into a large mixing bowl and remove skins (they should easily peel from the sweet potato). Roughly mash the sweet potatoes. 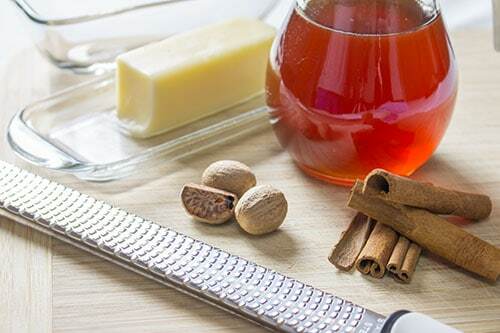 In a second smaller bowl, add the butter, honey, cinnamon, and nutmeg. Stir in the honey butter to the potatoes. Taste the mashed sweet potatoes and add salt and pepper to taste. Devour on your favorite baked goods. 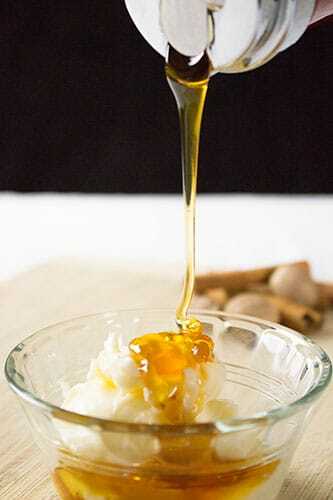 Honey Butter is also great on baked sweet potatoes, hot biscuits, and rolls. The pic looks so mouthwatering! I can’t wait to try this one! Thank you for sharing!